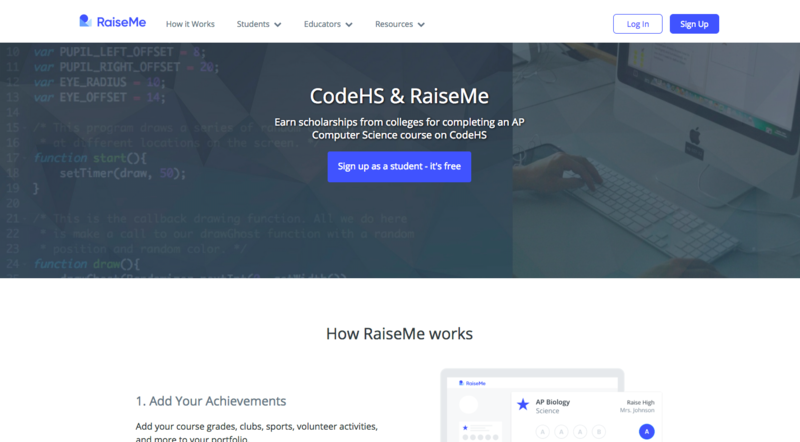 Through the new CodeHS and RaiseMe partnership, any CodeHS student who completes the AP Computer Science Principles or Java course can submit their coursework on RaiseMe to earn a scholarship for their academic achievements on our platform! Enroll in an AP Course on CodeHS: Once you enroll in AP CSP or AP Java, you can start documenting your CodeHS achievements on RaiseMe to earn scholarships. Sign up for RaiseMe: Create a free RaiseMe account in minutes (or log in to your existing account) at Raise.me. Add CodeHS to your RaiseMe portfolio: Enter the CodeHS AP classes you’ve taken or are currently taking into your RaiseMe Portfolio. Discover colleges: Learn more about which colleges could be a great fit for you, earn scholarships for your CodeHS AP class, and see what other micro-scholarships they’re offering. Share that you’re interested by hitting the “Follow” button (for each school). Earn college scholarships: For your CodeHS classes, plus your other classes and activities, you'll earn micro-scholarships from colleges, the sum of which you'll be awarded when you attend that college. To learn more, visit codehs.com/info/resources/raiseme.